Home/ Cheapest/Newsroom/Offers /Brand New Ford Figo To Be Won ! 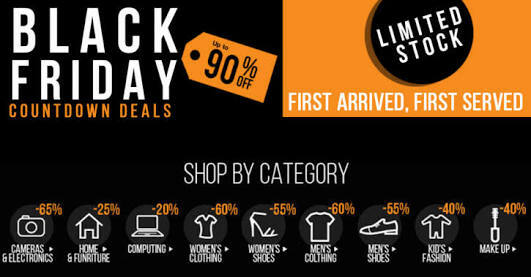 Jumia Black Friday ! Brand New Ford Figo To Be Won ! Jumia Black Friday ! Black Friday is a word used to refer to stock market crashes which became popular among the US Philadelphia in the 1960s as a result of overwhelming traffic congestion they had to contend with during weekends. Black Friday became a recognized terminology in the 1990s which Jumia later joined up in 2014. Jumia one of the leading online trading platform, Black Friday 2017 is almost here. You can easily tell everybody is excited and waiting impatiently as it is just around the corner. Black Friday is the hottest shopping season of the year with partners: Intel, Pampers, Infinix, PHILIPS, FERO, hp, MTN, AIRFRANCE & KLM. Also has the attribute having been one of the most anticipated shopping season of the year. Why ? Simply because this is the only time we can get exclusive deals on Jumia (once a year) coming after Thanksgiving i.e. Thursday of November and also marks the beginning of the Christmas holiday shopping season. Great ! Jumia Black Friday will officially start on the 13th of Nov. To 13th Dec. 2017 which implies, that it will be opened for a month according to the date. Warri, Benin, Kano & Kaduna as it is power by Jumia Express. 100,000+ vouchers to be won every day through Jumia Black Friday wheel of fortune. Lotteries such as flight ticket to Europe, Home Theater, LCD TV’s, and even to the extent of winning a brand new Ford Figo ! Wow ! Samsung Galaxy Prime Plus 4G LTE rated before at N50,000 now at N38,000 and also comes with Jumia Express. And Lots More Than We can ever Imagine!!! Also watch out for new deals every day, flash sales several times in a day. 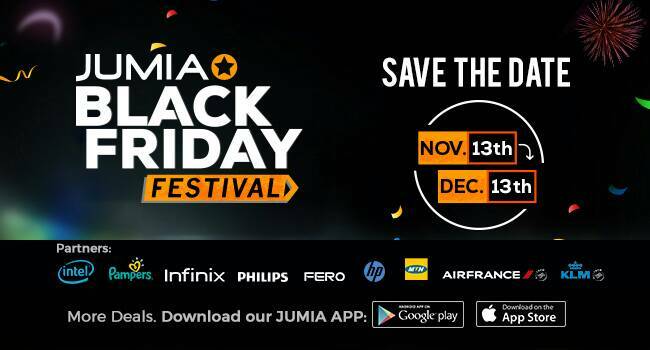 JUMIA BLACK FRIDAY WILL LIGHTING UP WITH EXCLUSIVE DEALS, DISCOUNTS, OFFERS AND GIVEAWAYS!!! GET READY.